This event is sponsored by Gilligallou Bird Inc., Eastern Ontario’s Backyard Birding Specialty Store. Just click on the logo to visit their website. 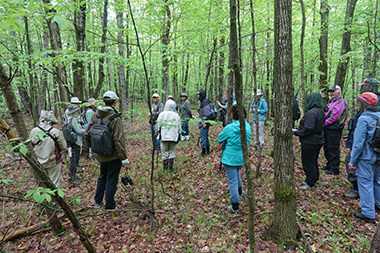 On Saturday, May 26th, the Mississippi Madawaska Land Trust (MMLT) hosted an event titled Discover the Wonder of Warblers on the High Lonesome Nature Reserve near Pakenham. Thirty two intrepid, budding nature enthusiasts joined Art Goldsmith, Simon Lunn and Michel Gauthier from the Welcome Centre to Joel’s Pond. We were treated immediately to the call of a male Common Yellowthroat, who then made an appearance, giving photographers some wickedly colourful poses. These diminutive middle weight warblers (10 grams or less than half an ounce!) had just returned from as far away as Central America and Mexico, much like some of the retired humans in our area. Other warblers also come to High Lonesome Nature Reserve, to breed in its forests (these ARE Wood Warblers, after all) or to feed before carrying on to the far north, and west. As we wound around Joel’s Pond, we were treated to a very uncommon sound: a Sora calling from the marsh joined soon after by a Virginia Rail. Wow, that is like two consecutive home runs! Warblers were back on the agenda, after the twitters of excitement waned a little. An Ovenbird, and a Pine Warbler caught the attention of the hikers. Pine Warblers cause maximum neck movement, as they tend to feed near the tops of the tall White Pines around the pond. Not to be outdone by these wee insect gourmands, a Rose-breasted Grosbeak made an impressive entrance, reminding us that seed eaters may also be impressive visual statements. The other side of the pond also delivered some results, as a Black and White Warbler’s very quiet call was heard followed by an appearance. 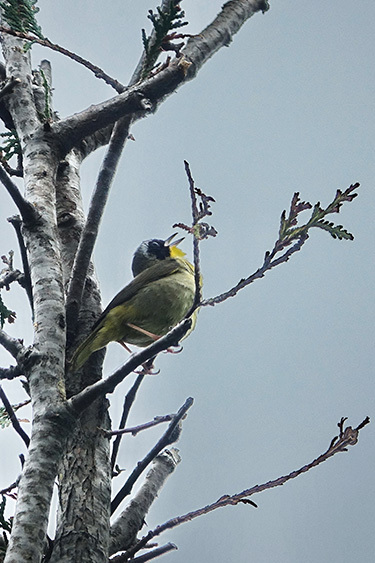 These birds move up and down the trunks of trees hunting down invertebrates. 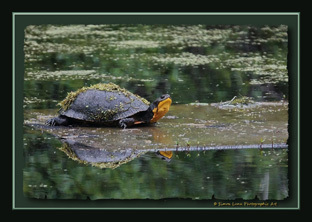 As our trek ended, the group was treated to the presence of a very large Blanding’s Turtle in another pond close by. There is nothing like capping off a successful nature outing with a quiet observation of one of Ontario’s threatened wildlife species. It gives us hope! And our support of the Land Trust is rewarded. High Lonesome Nature Reserve is one of seven properties conserved by the Land Trust. Over 2,500 acres of ecological significant land in eastern Ontario have now been protected by MMLT, which is celebrating its 15th anniversary this year. High Lonesome Nature Reserve is open to the public year ’round. A Google map to the property can be found below for your convenience.